Se7en is a dark, brooding film focusing on the nature of sin. It’s atmospheric, beautifully shot, and thoughtfully constructed. Unfortunately, The Game was a painfully disappointing follow-up where Fincher’s cynicism provided too much of a gap. The movie has the veneer of something cathartic and exciting, but whereas the darkness of Se7en had an nasty, beating pulse, The Game was a limp mish-mash of ideas that still managed to culminate into something thoughtful, but the thought was unrewarding when compared to the other movies Fincher would make in most of his other movies. Se7en was a huge step forward, but The Game was an awkward retreat into the basics of filmmaking rather than a glimpse into the soul of its shallow protagonist. Beginning with the world’s WASP-iest home video of a ridiculously unhappy birthday party, we’re quickly informed that a depressing childhood has been further marred by a father’s suicide leading ultimately to a son’s isolation. 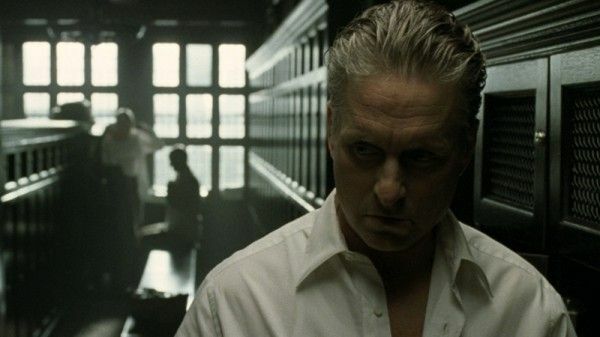 Nicholas Van Orton (Michael Douglas) is in the process of rebirth as he puts on a watch commemorating his 18th birthday while barely paying any attention to the fact that the day is his 48th birthday. When he gets a surprise call from his brother Conrad (Sean Penn), it’s a reluctant celebration with his closest living relative. For Nicholas, it’s better to be withdrawn. The purpose of Nicholas’ character is to discover he not only needs other people, but also that he has to start living his life. It’s A Christmas Carol meets Wall Street minus any sympathy whatsoever. Set aside the fact that we’re supposed to be rooting for an investment banker. Even Fincher doesn’t really have as much interest in Nicholas beyond setting him up as a pawn and trying to do it as quickly as possible. When Nicholas arrives at CRS, it serves a dual purpose: humbling Nicholas and setting up CRS as an ultimate power. Nicholas is told the process will only take an hour, and it ends up taking the entire day as he’s poked, prodded, and even assaulted with disturbing images. CRS claims these tests are to ensure that the game is tailored specifically to Nicholas, but as viewers, it’s to let us know the dominance of CRS. Fincher shoots their office more like a hi-tech prison as frosted glass chambers informs the inmate that something’s happening on the other side, but he can’t make out what and he can’t get out. The movie is gorgeously shot (something I could only appreciate once I watched the movie on Blu-ray), and in its own way, it’s as oppressive as Se7en and Alien 3. Fincher loves soaking his movies in darks that eat away the corners of the frame. Soon after the “game” begins, Nicholas is at his country club, and even the locker room is closing in on him. It gets to us on a subconscious level so we’re already on edge when we see something as overtly creepy as the clown puppet, which is found in the same place as his father’s body. There’s a lot of menace in The Game but never much threat. Nicholas’ unease keeps coming from the notion that he’s not really playing a game except he should always know he’s playing a game. If anything, he’s getting the full package: adventure, romance, mystery, and the follies of a youth he never had. We can tell that Nicholas Van Orton is someone who never got in trouble a day in his life because he had no choice. He had to fill his father’s shoes, and so Conrad got to be the irresponsible one. The Game is a movie about making movies. It’s not about Nicholas Van Orton. It’s not about him coming to grips with his father’s death. And even though on the commentary track John D. Brancato and Michael Ferris say it was Fincher who pushed the script in more of a “Scrooge” direction, it’s not about Van Orton really learning from his mistakes to become a better person. There’s no wrong he has to right at the end of the movie beyond whether or not he’ll take one more leap of faith and go on a date with “Christine” (Deborah Kara Unger). That’s an underwhelming achievement at best.